Metallic trend is everywhere and nowadays you can find any clothes, accessories and shoes with a metallic touch. No doubt they will make any outfit more eye-catching, stylish and chic. Wanna try it? Then choose metallic shorts for hot summer days. You can find any type of shorts you want and combine them with loose shirts or printed t-shirts and various types of sandals. 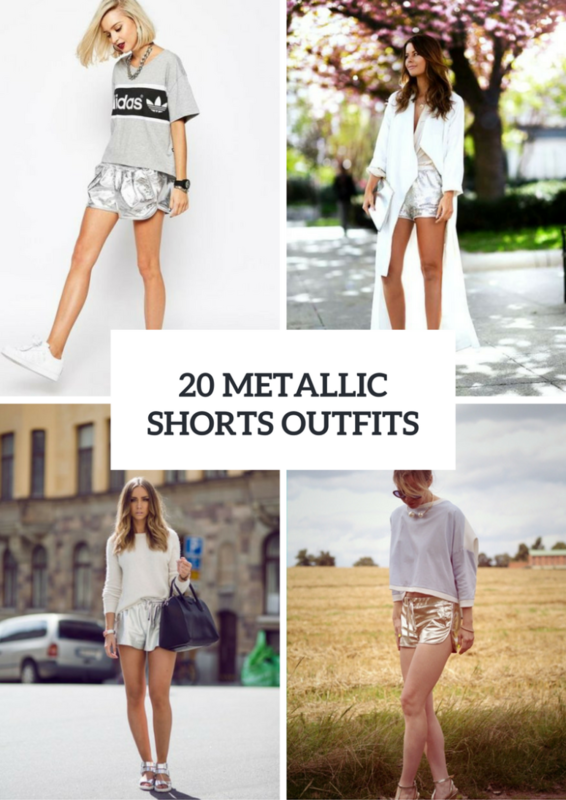 Silver and golden shorts are the most common and popular metallic ones among fashionistas and bloggers, and they look perfect with almost any color. Now you can scroll down to see all collected pics and repeat some outfits. If you want to create sporty and comfy outfit, then take sliver dolphin shorts and pair them with a printed or monochrome t-shirt, white sneakers and a chain necklace. Or you can take a loose sheer shirt, golden shorts with a belt, black sneakers and a black tote. To make your outfit brighter don’t be afraid mix your metallic shorts with metallic shoes or accessories, for example, you can combine a beige sweatshirt with silver shorts, silver flat sandals and a black leather bag. If you love original ideas, then try to pair a white top with metallic mini shorts, black lace up sandals, a black tote bag and a white duster coat. 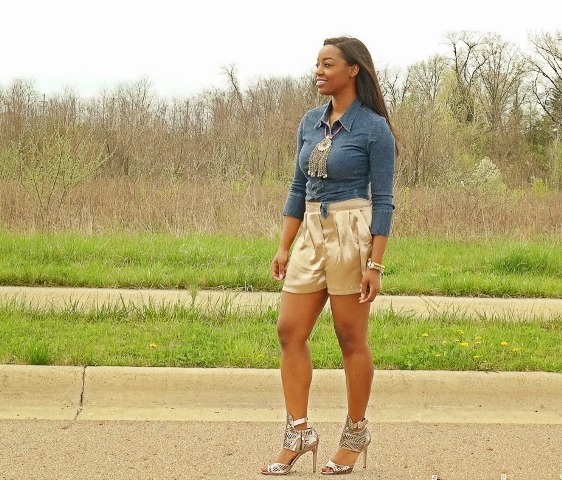 For creating casual outfits choose a denim button down shirt and combine it with golden mini shorts, metallic heels and a statement necklace. Or you can change your denim shirt to a striped one, add a gray vest and a clutch and change metallic heels to pink pumps. If you wanna create a romantic look, mix a pale pink blouse with silver shorts, pale pink pumps and an orange crossbody bag. For more ideas look below.